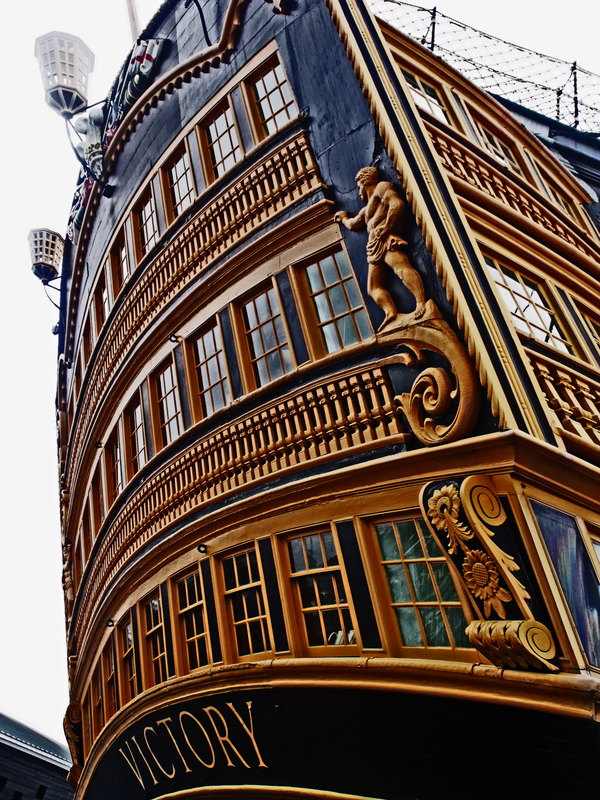 HMS VICTORY is the oldest commissioned warship in the world and the only surviving First Rate Ship of the Line of the period. Her design is a careful balance of fighting qualities, including fire-power and stability, with structural strength, handling and sailing qualities which included a speed of around 10 knots. Consequently she had a long and successful history as a warship with an impressive list of battle honours, the most famous of these being the Battle of Trafalgar where the ship acted as Admiral Lord Nelson’s flagship. As a result she is a national and international icon with a special place in the affection of the British people. Now restored externally and internally to her 1805 condition she is a living museum to life in the Georgian Navy. 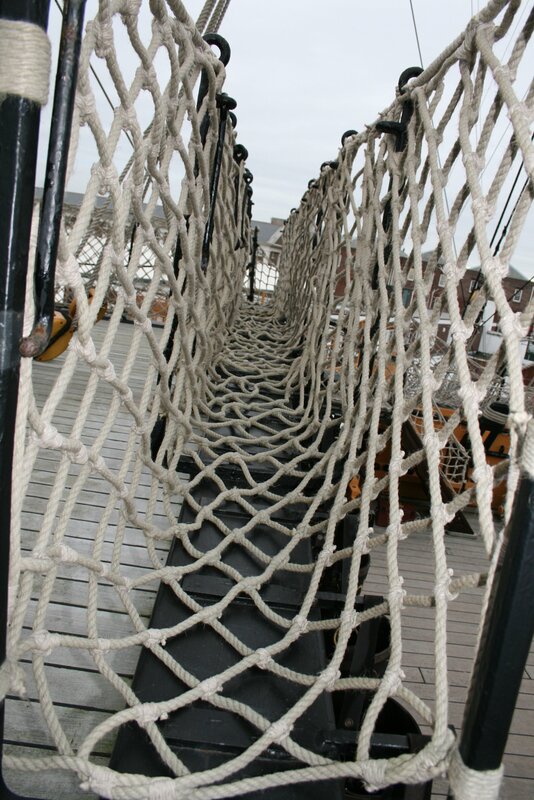 Visitors leave the ship with a clear understanding of what it was like to live and fight in a Ship of the Line, and in particular the conditions and routines before, during and after the Battle of Trafalgar. 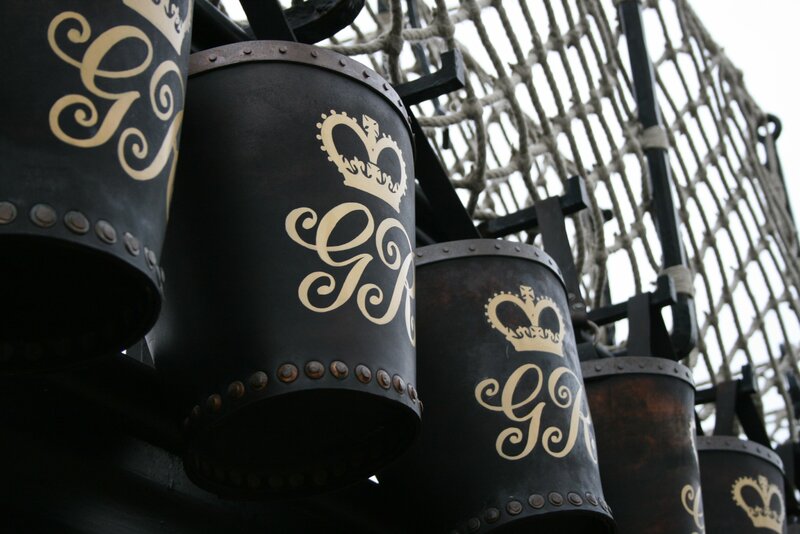 The ferocity of the battle is brought home by the condition of the fore topsail which was severely damaged by upwards of 90 cannon balls and projectiles and is on display in the Royal Naval Museum, Portsmouth . 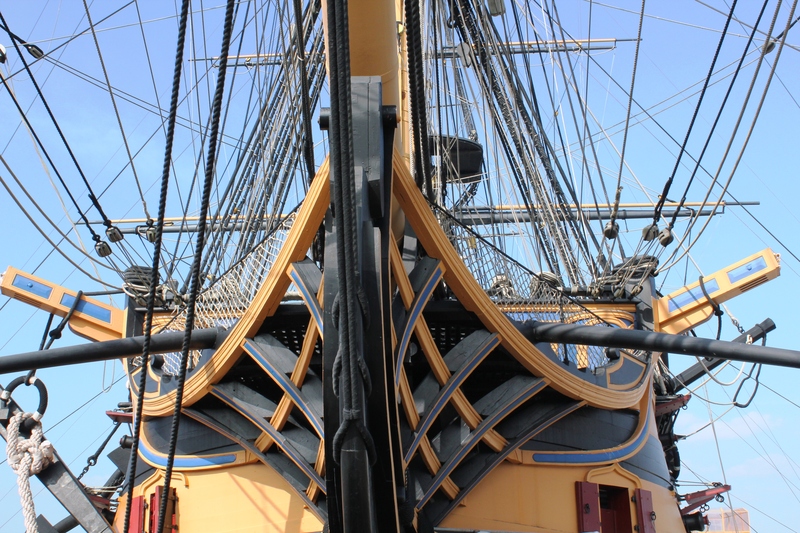 HMS VICTORY represents the embodiment of British Naval mastery at its absolute height, when Britain’s supremacy over all her actual or potential enemies was unchallenged and the Royal Navy enjoyed supreme command of the world’s oceans. The death of Admiral Lord Nelson and the Battle of Trafalgar is remembered every year with a dinner in every officer’s mess in the Royal Navy. 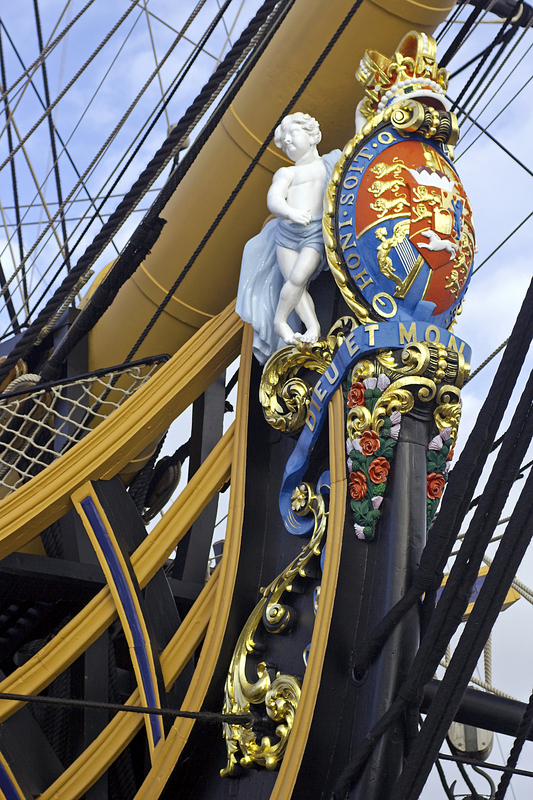 There are a number of Nelson Societies which maintain links with the ship. 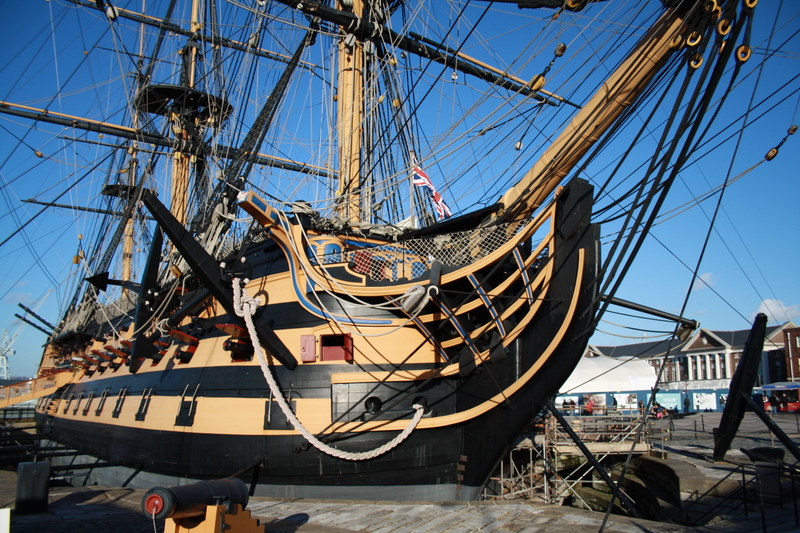 The ship is preserved and presented to a high standard and is the leading attraction in Portsmouth Historic Dockyard and a major landmark in the City of Portsmouth. She is held in great affection by the local residents. 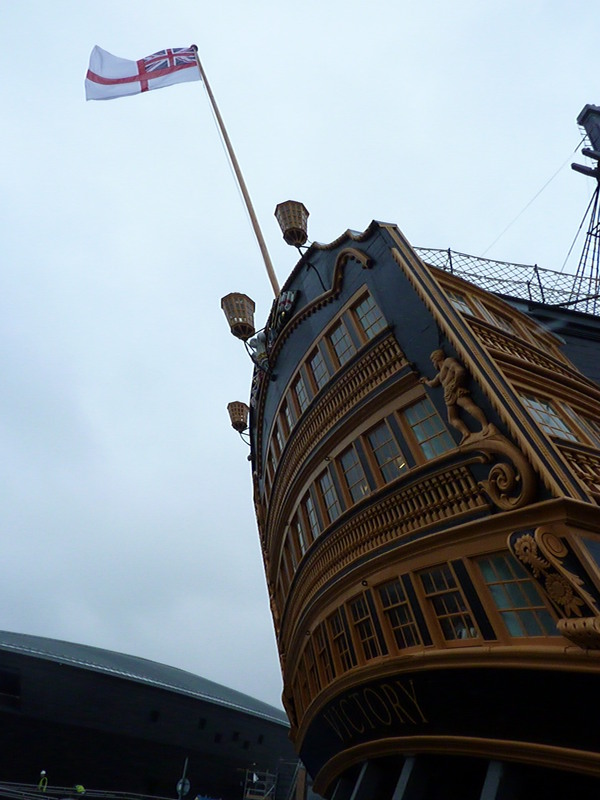 HMS VICTORY was designed by Sir Thomas Slade, Senior Surveyor of the Royal Navy. 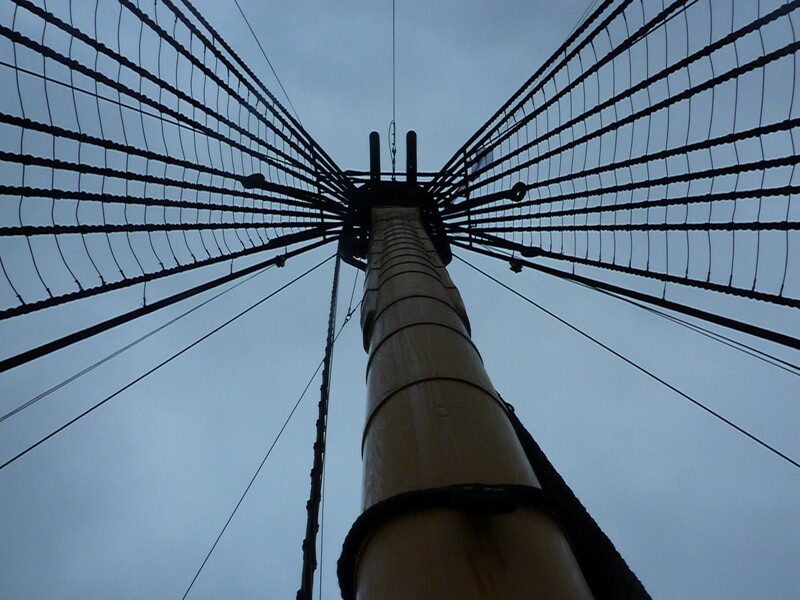 She was launched in 1765 and used around 6000 trees of which 90% were oak, the remainder being elm, pine and fir. 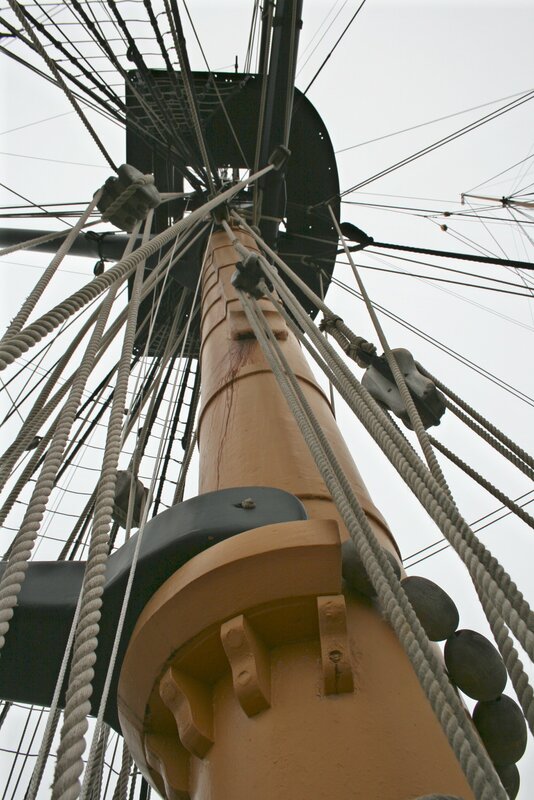 She was not commissioned until 1778 and this long period of weathering resulted in her timbers being well seasoned which was a major reason for her long life. She was a First Rate Ship of the Line with an outfit of 100 guns on 3 decks. 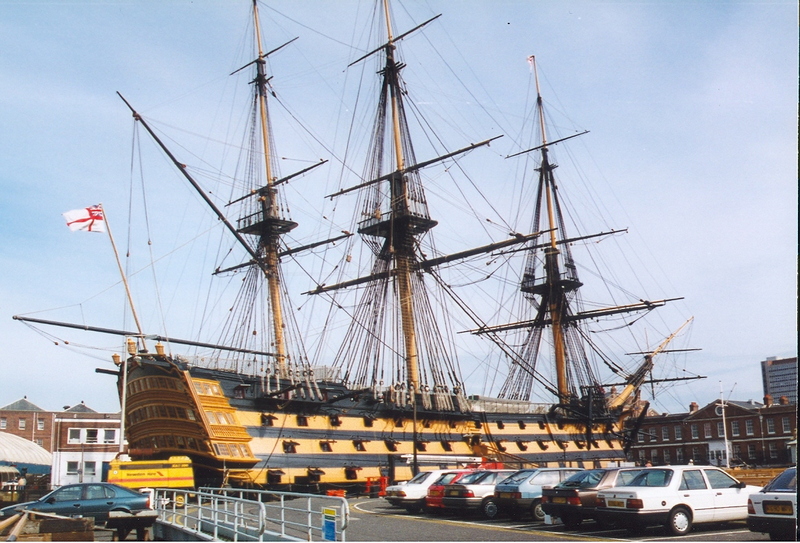 HMS VICTORY was in active service for 34 years. She served as the flagship to a number of distinguished Admirals and fought at the first Battle of Ushant in 1778 (Keppel), the Second Battle of Ushant in 1781 (Kempenfelt) and the Battle of Cape St Vincent in 1797 (Jervis). In 1797, she was pronounced unfit for further active service and was due to be converted to a hospital ship. However, when HMS IMPREGNABLE was lost in October 1797 leaving the Admiralty short of a First Rate, the decision was taken to refit VICTORY which took place at Chatham between 1800-1803. 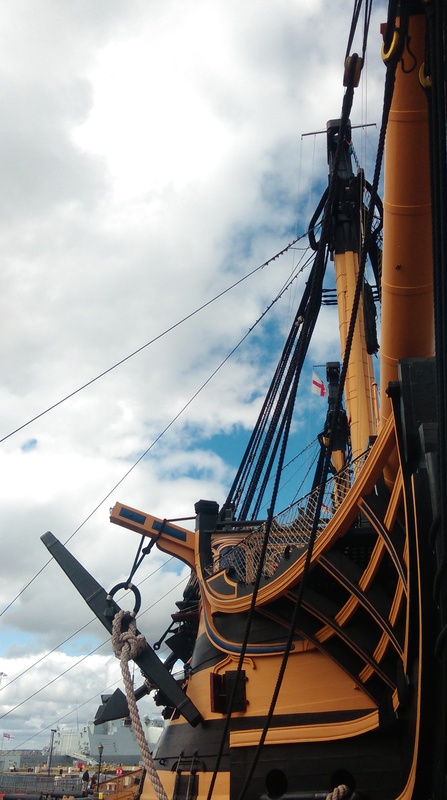 As part of an extensive reconstruction, extra gun ports were added, increasing her guns from 100 to 104, the magazine was lined with copper, the masts were replaced and the paint scheme changed from red to the black and yellow seen today. She sailed for Portsmouth in April 1803 and Nelson hoisted his Flag onboard in May 1803 as Commander-in-Chief of the Mediterranean Fleet. Admiral Lord Nelson was VICTORY’s most famous Admiral. On 21 October 1805, she led the British Fleet under his command into battle against a Franco-Spanish force off Cape Trafalgar. Nelson was shot at the height of the battle and died at 16.30 when victory was assured. 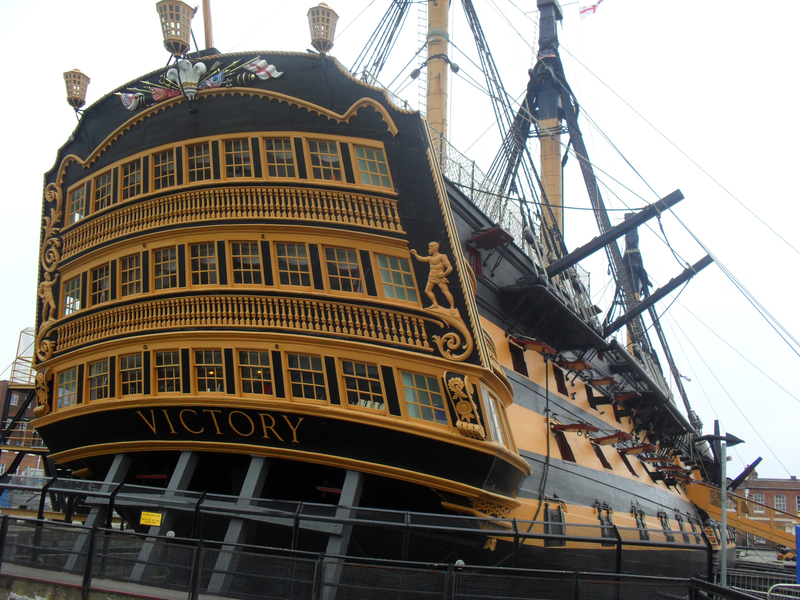 VICTORY suffered a lot of punishment, 57 men were killed and 102 wounded, and the ship was so badly damaged that she had to be towed to Gibraltar for emergency repairs before returning home with Nelson’s body onboard. 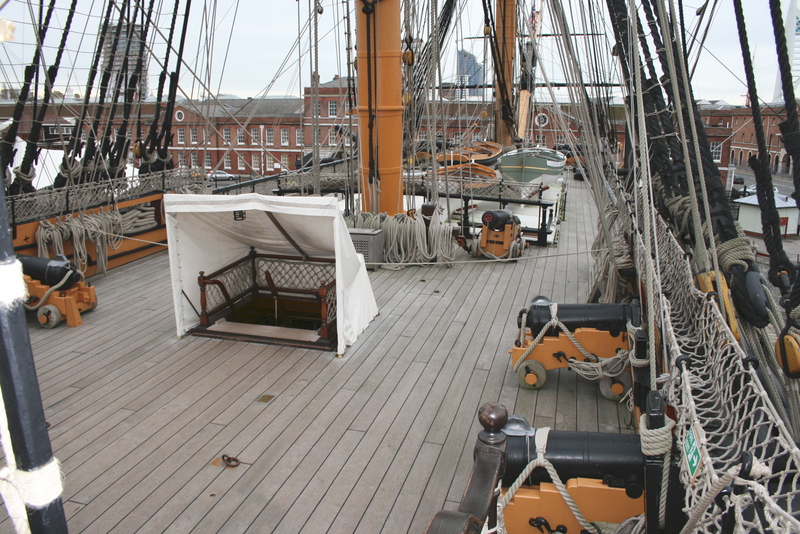 After further service in the Baltic and off the coast of Spain, VICTORY was placed in reserve in 1812 and was moored off Gosport as a depot ship. 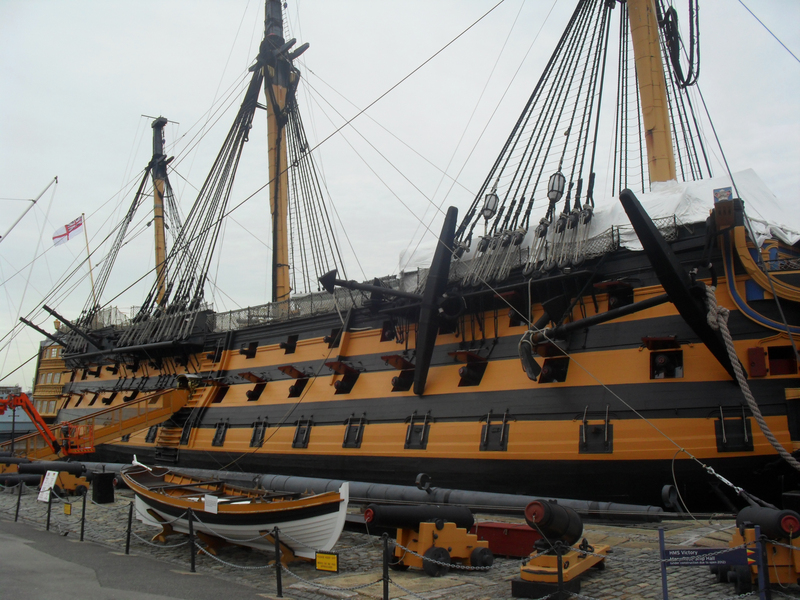 Flagship of the Port Admiral, Portsmouth from 1824, she became flagship of the Commander-in-Chief in 1899. She then slowly deteriorated at her moorings until a campaign to save her was started in 1921 by the Society of Nautical Research (SNR). In 1922 she was moved into No 2 dock Portsmouth, the oldest drydock in the world, for restoration. The work was completed in 1924 and preservation continued under the supervision of the Society for Nautical Research (SNR). 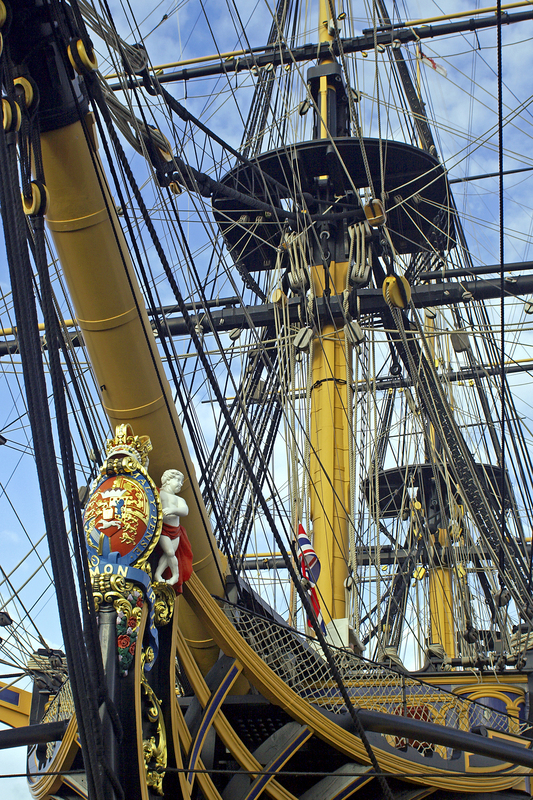 The ship subsequently underwent another extensive restoration programme to make her appearance as close as possible to that at Trafalgar, for the bicentenary of the battle in October 2005. She is still in commission as the flagship of the Second Sea Lord/Commander-in-Chief Naval Home Command. Vessel currently undergoing an 18-month programme to re-support her as she is sagging under own weight in dry dock. Rather than the existing steel 'blades', which are placing considerable strain on the hull structure, these will be replaced by 134 15-foot adjustable steel props fitted over two levels. 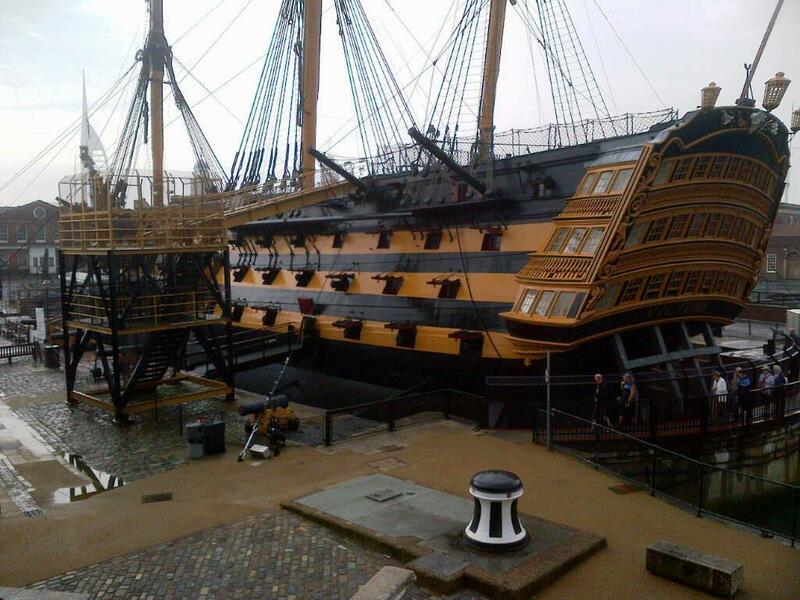 The ship remains open to visitors in Portsmouth Historic Dockyard.